EBAY CHARITY REGISTRATION - For some time now various members have been selling all manner of items on E-bay and donating hte proceeds to RVP. Now you can do this automatically! E-Bay have introduced the facility for sellers to automatically donate all or some of the proceeds of their sales to a charity. RVP is now registered for this scheme (you'll find us under "Culture, sport and recreation"). Users of E-bay should go through the sell procedure in the usual way, but select a charity when you get to the pricing section. The chosen proceeds of your sale will then come automatically to RVP, and gift aid can be added if desired. If somebody would like to try this out I'm curious if it works! Long stored BTK 57451E is receving a tidy up. The old rotten paneling is being removed. This is then having new plywood cut to replace it. This will then be painted to make the vehicle much more presentable (It is likely to be in store for a few more years). NUNCKLEY HILL PLANNING application has been submitted. The repainting of the roof on GUV 93579 was (finally!) completed on Saturday. In the background welding work on our CCT is now underway and this will receive its own repaint shortly. Work on 24278 roof continues. Update, and significant news, on the Nunckley Hill project should follow on Sunday. BURTON RAIL FAIR - The sales and display stand will be at Burton Railway Society's annual Rail Fair, this Sunday 20th Nov (Town Hall, Burton from 11am). Do come and see us; volunteers also welcome to man the stand. Work is currently focussed on buffet car 24278. This is having the ceiling formers cut and fitted. Work has also started on the fitting out of the Beavertail interior, with the ceiling started. Meanwhile, on the Nunckley Hill project, the surveying is now complete with the plans being drawn together for the planning application next week. Full updates on all of this to follow next week. The repaints of both our own GUV (93579) and the adjacent GCR owned one, on the stores siding at Rothley, have been completed. The result has smartened the view from passing trains up considerably. MAIN LINE STEAM TRUST GRANT - MLST, the GCR's main supporting charity, have confirmed the award of up to £25,000 in match funding for our Nunckley Hill project. MLST will match, pound for pound, every donation to this appeal up to a maximum of £25,000 thus significantly helping us achieve the appeal target. This significant assistance is very welcome. The appeal has got off to a good start, but we'd clearly like to raise the rest as soon as possible. Use the link below to reach the Nunckley Hill pages and see a current update on progress. TPO TRAINS and MUSEUM OPEN this weekend - The LNER TPO set will operate mail exchanges at Quorn during the GCR gala weekend. Friday night sees one trip in the dark at 18:50, while Saturday and Sunday see one train each morning at 09:30. Following this the museum inside the vehicles will be open for viewing at Leicester North. 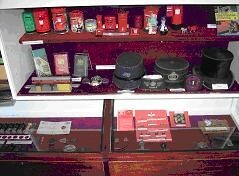 The full museum display has now been set out for the first time since the overhaul. Also in the recent past the repaint of GUV 93579 has been completed, work has now transferred to the adjacent GCR GUV which is being given a quick tidy up to match ours in undercoat yesterday. Finally the CCT on the same siding is receiving body repairs before its own repaint. Out of the wilderness! - Apologies for the lack of updates recently, because of prolonged problems with the PC - and a major PC retailer (probably best not to mention them!). Aplogies also to anyone who has had e-mails ignored for the same reason - please resend anything that has not been responded to. Normal service will resume shortly. Loads has happened since the last update; the Nunckley clearance and surveying has progressed, the Beavertail has taken several significant steps forward and restoration work has continued. Full updates will follow next week, but in the immediate future (7/8/9th October)the LNER TPO set is running on the GCR. An evening run on the Friday at 18:50, with one run a day Saturday and Sunday at 09:30. The rest of the weekend the set and musuem will be open for viewing at Leicester North. We need staff for these trains - TPO crew members please contact Darren. "RAILWAY LIVES" - 6pm Sundays, ITV Midland's region, will this week feature the story of TPO's and should include a significant section filmed aboard our TPO set during the recent summer gala. Monday group update - having completed the TPO set work has moved on to repainting the workshop and stores vans - This is the CCT in undercoat. A surprise in the finished livery is possible - keep an eye on it! The LNER TPO set was relaunched on Saturday as part of the very successful GCR summer gala. A short ceremony was held on Loughborough station prior to the departure of the first TPO run to dedicate the Tender vehicle to Brian Green. Ken Hathaway, the final District Head Postmaster at Leicester, delivered a speech recalling Brian's long working life in the Post Office followed by his considerable dedication to preserving that history with RVP. Following this the set went on to operate four mail exchanges over the weekend with some very large and appreciative audiences at Quorn (happily reflected in the collecting Tin). In addition on the Sunday a film crew joined us making a further episode in the series "Railway Lives". This is currently showing in the Central region at 6pm on Sundays. This particular episode is expected to appear in around three weeks time. Many thanks to all those who staffed the TPO over the weekend and, of course, all the GCR staff who operated probably the most punctual gala I can remember seeing anywhere. ECOLOGIST NEEDED - we need a qualified ecologist to complete a survey at our shed site as part of the planning application. If anyone is willing to carry this out either voluntarily or at a reduced rate we'd love to hear from you! Pictures of the interior of the Tender vehicle (70268E). This was completed yetserday and is ready to re-enter service with the sorter (70294E) on Saturday. RETURN OF THE GCR TPO - The complete LNER TPO set (sorter 70294E and tender 70268E) is now ready to re-enter service on the Great Central at the forthcoming Summer gala next weekend (23/4th July). 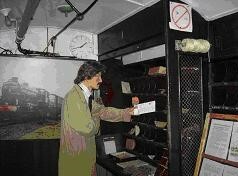 Two mail exchange runs will take place each day (approx 11:50 and 16:20 at the exchange equipment at Quorn). 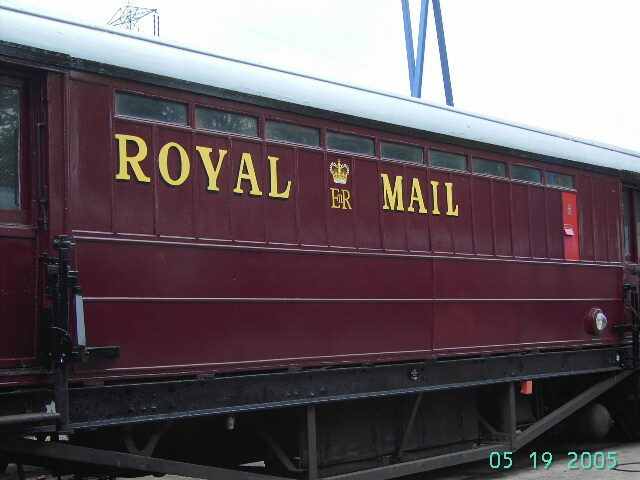 Before the first run on the Saturday (11:30 at Loughborough station) there will be a short ceremony to dedicate the postal museum in the tender coach to the memory of Brian Green, who died last year while the set was stopped for maintenance. This will include the unveiling of a plaque marking the event inside the museum by Ken Hathaway, the final Head Postmaster at Leicester (and a work colleague of Brian's). 70294E operated for the final time on the Nene Valley over this weekend. 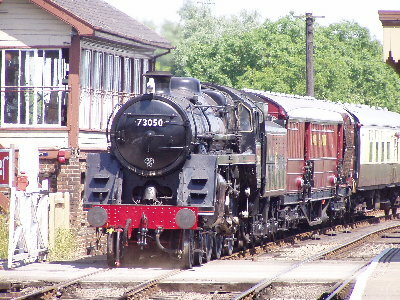 This included its first runs with newly restored Standard class 5 No.73050. It has completed over 50 exchange runs during its four week holiday with no major problem, although (in an annoying demonstration of Murphy's law in action) after the final exchange run this afternoon one of the brake cylinders ceased on the final short run back to Wansford. This will now need rectifying before the GCR runs on 23/4th July. NUNCKLEY HILL PROJECT LAUNCHED - Text of a press release put out today follows; new web pages for this project HERE. 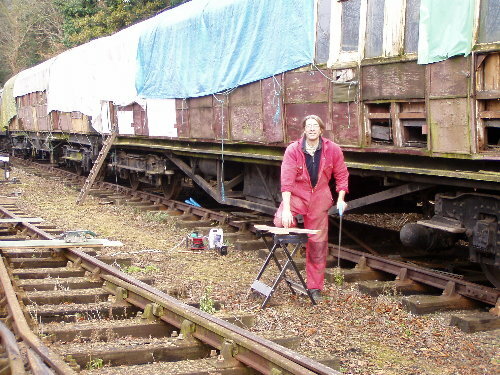 Award winning railway carriage preservation group announce major new project at the Great Central Railway.Lease signed on land. 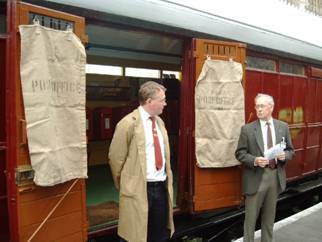 Railway Vehicle Preservations Ltd, the award winning charitable historic carriage group based on the Great Central Railway, today announces the launch of a major project to provide covered accommodation for their collection. Excitingly the project will also lead to the recreation of a typical branch line scene to compliment the railways main line. A lease has been taken on the first half mile of the former branch line from the Great Central Railway at Swithland. This track bed, which has been disused since the mid sixties, curves away from the preserved section of the GCR and formerly ran through to the quarries in the Mounstsorrel area. The section that has been leased extends to the boundary of the former Nunckley Hill quarry site, a few hundred yards from Swithland Lane. 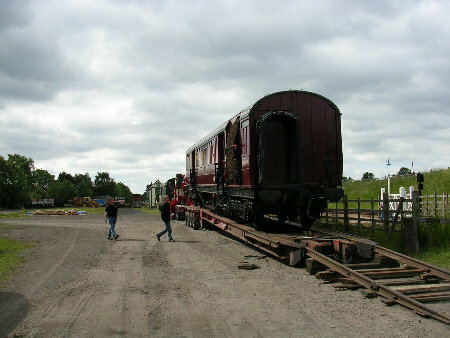 Track is to be re laid on the branch and sufficient space is available to build a shed to house the majority of RVPs historic collection which includes some unique survivors; two wooden bodied traveling post office vehicles amongst others. The shed would be on a site adjacent to (but largely shielded from) the Great Central Railway. Informal planning advice has been positive and a formal application will follow in due course. However the signing of the lease is a major step forward and signals the start of 'Operation Nunckley'. It is envisaged that the project will be funded by a mixture of grant funding and public appeal; specific grant applications will be made under the Land Fill Tax Credit scheme (for clearing and relaying the branch) and Heritage Lottery Fund (for the shed). The project has the full support of the Great Central Railway, but will not draw on the GCR's financial resources. RVP is a registered charity and donations under this appeal are eligible for 'Gift-Aid'. 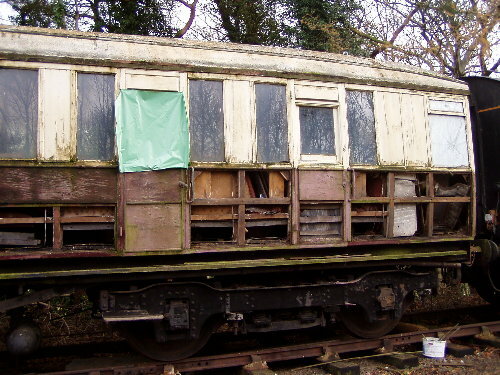 Donations should be made payable to 'Railway Vehicle Preservations Ltd' and sent to 22 Grange Street, Burton On Trent, Staffs, DE14 2ES. NENE VALLEY TPO - Sorter 70294E operated as planned over the past weekend as the star of the Nene Valley's Mail by Rail gala. As in previous years this was a very well organised and well attended event and it was a pleasure to be more involved this year. 70294E had no major problems and operated 8 round trips to the exchange equipment over the weekend, as well as a trip to Peterborough at the end of each day as part of the passenger set. Add in superb (if a little hot!) weather, very well turned out locos (especially 1306) and plenty of interest at the sales stand and this was a very good weekend. Pictures added to the gallery page. Our thanks to the NVR, and its TPO crew, for inviting us and the hospitality extended to us during our visit. 70294E will be operating again on 9/10th July - RVP members available to help out on this occassion please contact Darren. 15th June 2005 - TPO ON TOUR! Post Office Sorter 70294E left Rothley on Saturday bound for Quorn. From Quorn it left by road yesterday for the journey to the Nene Valley. It will be operating there this forthcoming weekend (and again on 9/10th July) - do come and see it on its first working holiday away from the GCR in the 23 years since it first returned to service. To mark the occassion commemorative covers will be available. This year these are in full colour and feature the "Trooping the Colour" stamps just issued. Limited numbers are available and these will only be sold at the Nene Valley events and the GCR gala (23/4th July). They will be carried on the TPO and cancelled with our own date stamp with either "Nene Valley TPO" or "Great Central TPO" as appropriate. Picture added to the BTK page. The exterior work on our LNER TPO set is now nearing completion. The brake cylinders on Tender 70268E are the only significant outstanding outside. A general tidy up of the interior of 70294E is underway, more extensive work on the museum interior of 70268E will then follow. The first appearance on completion will actually be at the Nene Valley Railway. 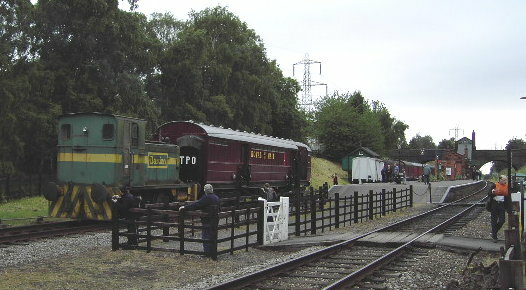 This is however a brief visit and the set will be operating on our home railway at the summer gala on 23/24th July. Meanwhile our next maintenance project, BGP 4050, arrived at Rothley shed on Saturday for a revarnish and roof paint. Work started immediately and will be the major focus of our work week next week (starting 30th May) - fancy a few days in the Leicestershire countryside varnishing coaches?? 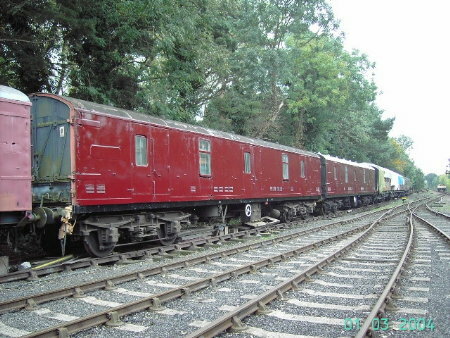 SLEEPER CAR SOLD - LMS design sleeping car 380M has been sold to Raileisure Limited, based at Louth station on the Lincolnshire Wolds Railway. It's interior will be restored to near original condition and used for accomodation as part of this business venture. Its long term future is assured and we wish its new owner well. NENE VALLEY GALA - is getting nearer (18/19th June). Members of our TPO / sales stand crew who haven't already spoke to me should e-mail me, particularly if intending to book hotel accomodation in the area. WORK WEEK 2005 starts on Monday 30th May and runs through to Saturday 4th June. We'll be at Rothley all week and the main aim is to revarnish pigeon van no.4050, but also conclude any finishing touches on the TPO set before it departs for its visit to the Nene Valley. We also have a host of other tasks to keep us occupied. WE NEED HELP! - If you can spare any time that week please come along. Most of the work is not particularly difficult but there is lots of it! Basic accomodation can be provided for further flung members if required. What could be better than a week (or part week) spent in the Leicestershire countryside restoring coaches? Further details - e-mail me. Updates added to theBEAVERTAIL, TPO overhaul and BTK pages. It is with pleasure that we can announce that the £5000 appeal to buy the teak panelling for this vehicle has been successfully completed. As a result its owner (Mike Lang) has now donated the vehicle itself to RVP Ltd. 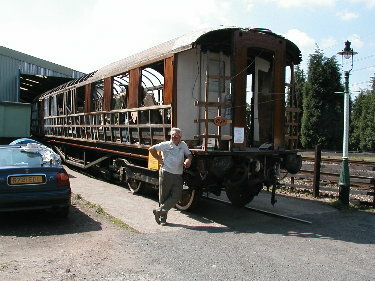 Heavy restoration work started on 24278 (BR no.9122E) six years ago funded by Mike. 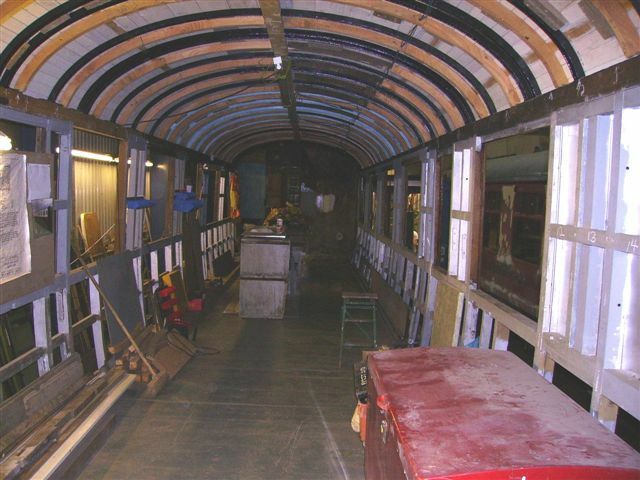 To date its underframe and bogies have been extensively restored, the wooden framing reapaired and new roof boarding fitted. In total it has had in excess of £10,000 spent on it and we wish to express our gratitude to Mike for donating the vehicle to us. In the recent past work on it was placed on hold while the TPO set took priority, but with the TPO nearly completed and the teak panelling purchased work will start almost immediately in getting it externally complete. 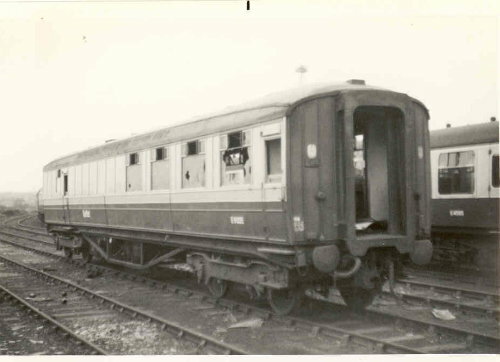 24278 is a key part of the intended teak train for the GCR, being the catering vehicle. The intention is now to continue working on it as a volunteer project with a new aim of having at least it and a companion vehicle completed for RVP's 40th anniversary in 2008. While the teak appeal has been successful (and our thanks to those who responded so generously) we do still need to maintain the flow of funds to ensure the teak set becomes a reality in a realistic timescale. Please continue to support us through donations and membership. 24278 at the time of its purchase for preservation in 1973. MLST Members day - Sunday 17th April. We'll be opening Rothley shed throughout this day so visitors can view the Beavertail and ongoing work on the TPO and other vehicles. Please come and see us if you're visiting the railway on that day. Update added to the TPO overhaul page. The sales and display stand was at Abbey Pumping station today - the number of visitors amazed me (the queue for the train rides was most impressive! ), and a very healthy amount of cash crossed our stall:-)) This is an excellent museum; the beam engines are magnificent and the steam event was very well organised. It is pleasing to see a museum packed with smiling faces - I can highly recommend a visit. Our thanks to the museum for inviting us. Our sales stand will be at Abbey Pumping Station museum, Leicester (next to the space centre and a short walk from Leicester North station) on Sunday from 1 to 5 pm. This is part of an event held there to mark the first steaming of their 2ft gauge loco "Leonard" on the railway system there. Please come and see us, and we can use extra help on the stand; please contact Darren if you are able to help out. Chris Prior resignation - Because of changed personal circumstances, Chris Prior has decided to resign as TPO manager. Chris has been doing this for nine years, and anyone who's travelled on our TPO vehicles will appreciate Chris's ability to keep everything under control, as well as the behind the scenes work to get trains formed as required and staff to man them. We'd like to thank Chris for his dedication over the years and wish him well in the future. The position of TPO manager is now vacant and we intend to appoint a replacement in due course. Suggestions / offers are welcome from amongst our membership. Visit to North York Moors gala - at this stage we're not sure whether the sales stand is going or not, however a group is going to visit anyway on 30th April/1st May stopping overnight in Whitby. If anyone (RVP members only) wants to go and requires accomodation please e-mail me by the end of this week. SALES STAND - Leicester Abbey Park museum 3rd APRIL - we have been offered a sales stand here, volunteers needed to man stand, again e-mail me please. Monday 30th May to Saturday 4th June - WORK WEEK at Rothley. Volunteers needed!!! 9/10th July - LNER Sorter 70294E operating on Nene Valley. 23/4th July - Complete LNER TPO set re-enters service at GCR Summer gala (TPO crews needed). TPO ON TOUR! 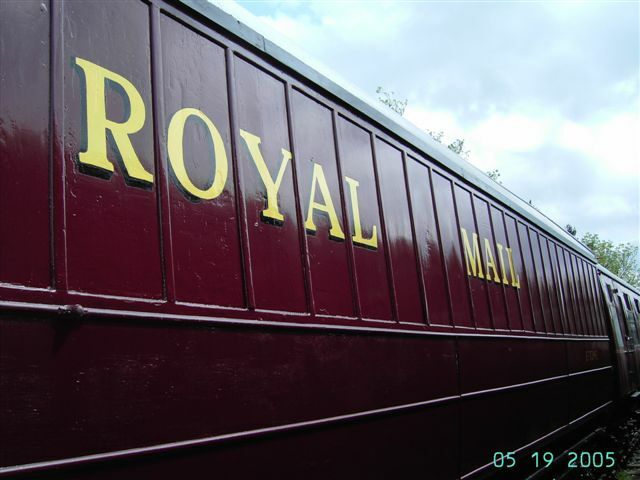 - The LNER post office sorter has been invited to visit the Nene Valley Railway for their "Mail by Rail" gala on 18/19th June. We are also able to take our sales stand over the weekend. Any members of our TPO team able to make themselves available for this weekend please contact me as soon as possible as we intend to book convieniant accomodation at the earliest opportunity. The sorter will return to the GCR in July and be reunited with the tender, and is likely to re-enter service as a complete set at the GCR summer gala (July 23/4th). At this time an event to mark the re-entry into service will take place and the postal collection dedicated in Brian Green's memory.Update added to the BEAVERTAIL page. BEAVERTAIL BODY REBUILD COMPLETED - John Robinson expects to complete the body and roof overhaul of Beavertail car 1719E on schedule for this coming weekend. It will therefore be on display at Rothley shed during the Winter gala weekend. At this stage it is not known whether the Beavertail will be inside or outside the shed (waiting for a weather forecast - we don't want to get it dirty:-)), but access to it will be provided and photography should be possible. We'll also have a sales and appeal stand both days to raise funds for the interior fitting out. The end result of the body rebuild is superb and a credit to John's abilities. I'm not going to post a photo in advance, you'll have to come and and have a look, its certainly worth the trip. This marks the completion of the first major stage in the restoration project and a very visible demonstration of where the money raised so far has been spent. We now urgently need to raise the outstanding £15,000 to complete the underframe and interior fitting out. Please come and have a look at it, and if you agree it represents money well spent please consider making a donation. A range of incentives provided by the GCR remain available for larger donors. The final completion date is now solely dependant on funds flow and is well within grasp. Update added to the TPO overhaul page. ANNUAL MEAL - RVP's annual dinner will this year be held at the Toby Carvery, Leicester Rd (B4114 - just off M1 Jn 21, south of Fosse Park), Enderby. 8pm on Saturday 29th January 2005. This is a carvery style meal and the price is £7.99. We need confirmed numbers and payment as soon as possible. The booking is being handled by Mike Lang so if possible please see Mike at Rothley shed. For our further flung members please e-mail me. As in previous years this meal is being held on the Saturday evening of the GCR Wintetr gala. The TPO will not be operating this year, but the Beavertail will be on display and we do need volunteers to man a sales and information stand to promote the appeal (to say nothing of the ongoing work on the TPO set!). Anyone wishing to stay over for the weekend e-mail me. 29/30th January - GCR Winter Gala - with Beavertail 1719 on display at Rohtley on completion of its body work. 29th January (evening) - Annual Meal - location and price to follow shortly, but will be in Leicester area. Please e-mail me or speak to Mike Lang. The TPO set is expected to be ready for service in April, GCR galas following this are July 23/4th and October 8/9th. Confirmation of TPO operation on these (and possibly other) dates will follow when known.